There is some math involved in creating time-lapse videos, but don’t let that scare you off—it isn’t very complicated. The basic concept is to decide how long you want your final time-lapse video to be, and then determine how many individual frames you will need. Then you can work out the amount of time between each frame based on the number of frames and the length of the event you are shooting. Remember, time-lapse photography compresses time so you can watch an event that takes hours in just minutes or even seconds. The first part of the math problem is to figure out how many frames you need in your movie. This is based on video specifications and the frame rates (frames-per-second, or fps) used to play movie clips—usually 24 or 30 fps (see the Frame Rates sidebar). The frame rate you choose to use is the basis for the number of frames you need. For example, if you go with 24 fps and you want to create a 30-second movie, then you’ll need a total of 720 individual frames (24 Å~ 30 = 720). If you want to create a 60-second movie, you’ll need 1,440 frames. Once you know how long your movie is going to be and how many frames you need, you can figure out how long the interval between frames should be. The first step is to determine how long the event you are photographing will last. Are you photographing the sunrise over a 30-minute period of time, or is it a much longer event, like a crew breaking down after a concert for four hours? Once you’ve settled on the length of the event, you need to translate that into seconds. A one-hour event, for example, is 3,600 seconds. So if you want to create a 30-second video at 30 fps to document a four-hour event, you will need to take 900 frames over a period of 14,400 seconds. That means that you need to take a single frame every 16 seconds. Sometimes you won’t know exactly how long the event you are trying to compress will last. In these cases, you should just use your best estimate. Doing the math for making a time-lapse is easy with an app. The good news is that there are numerous resources that will do this math for you. My favorite is the Time-Lapse Calc app for the iPhone, which gives you a very simple, clear, and easy-to-use interface for calculating the time between exposures. You can see the app’s data entry screen and the calculated answer for a different situation than the one above. 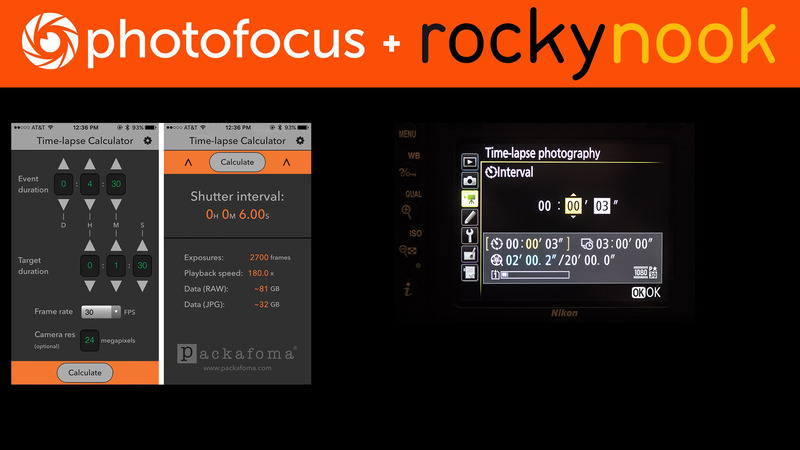 You can also find free time-lapse photography calculators on the Internet. Some cameras have time-lapse controls built in like this example for Nikon. The standard frame rate for movies shot on film has been 24 frames per second since around 1926 when sound film was introduced. For this reason, many people consider 24 fps to look more like traditional film and the newer, 30 fps standard (used originally in television) to look more like digital film. The real reason for the difference in appearance is that you use a different shutter speed for each frame rate, and the shutter speed can affect the amount of motion blur in a movie. The longer the shutter is open, the more motion blur is introduced into each frame. The standard recommendation for recording movies is to use a shutter speed that is double the frame rate. So if you’re recording at a frame rate of 24 fps, your shutter speed should be 1/50 second (closest to 1/48 second), and when using 30 fps, your shutter speed should be 1/60 second. The images shot at 1/60 second will show less motion blur than the ones shot at 1/50 second. This might not seem like a lot, but it can make the final movie look quite different. This does not really apply when you’re creating a time-lapse movie since the movie is not recorded in real time; you’re just selecting the frame rate at which the movie will be played back, so you can use either 24 or 30 fps for your output. I use 30 fps for most of my time-lapse movies because I like the way it looks—it’s as simple as that. Share Your Best Time-Lapse with a link in the comments section and share it with the Enthusiast’s Guide community! Follow @EnthusiastsGuides. Post your image to Instagram with the hashtag #EGTimeLapse. You can also search that same hashtag to view all the posts and be inspired by what others are shooting. Read more from Rocky Nook Enthusiast’s Guides.